The #Bone Shaker has been a staple of the Hot Wheels brand since it was introduced in 2006. The #Peanuts comic strip ran in newspapers across the United States for 50 years. Both meet here as the latest release of the Hot Wheels Bone Shaker features the famous Peanuts scene where #Charlie Brown falls on his backside, after the football he is trying to kick, is pulled away from him by Lucy Van Pelt. Since Lucy is featured on the #Purple Passion in this 6-car, #Kroger Exclusive series, this #Bone Shaker is all #Charlie Brown. Whereas, the actual Charles M. Schulz artwork can be found on the blister card. Behind Charlie Brown is a large #0, giving this Bone Shaker a little bit of a racing look. Lastly, the #Peanuts Series #Bone Shaker comes in one of my all-time favorite Hot Wheels colors: Satin Anti-Freeze. This color has almost a glowing quality about it, and it really shows off the casting’s detail well. Fans of the original “open-top” #Bone Shaker designed by Larry Wood, should be happy to see this version of the vehicle back as it seems the hardtop version of the Bone Shaker has gotten more use as of late. What didn’t come back with the open-top casting is the metal base, as this release got the plastic treatment just like last year’s mainline release. 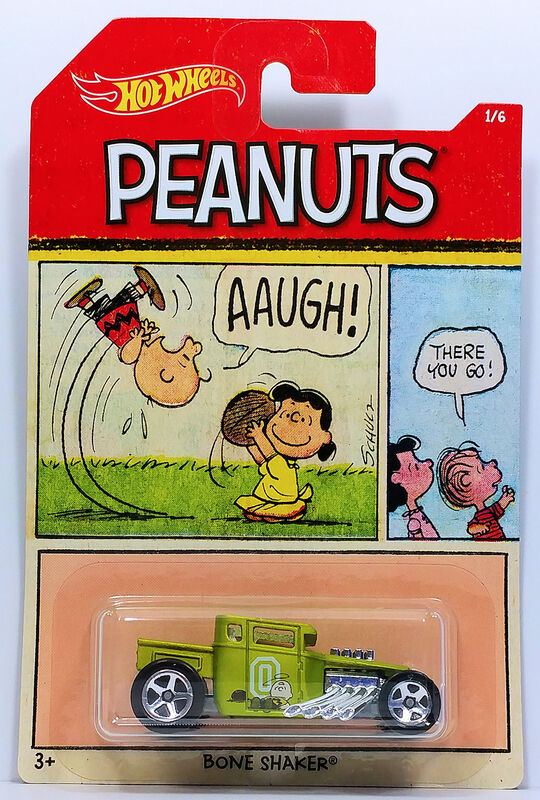 That is hardly a reason to pass up this one however, as this is one good looking Bone Shaker — #Peanuts licensed graphics and all. RELEASE DETAILS: Satin Anti-Freeze Body (metal). Chrome Interior. Chrome 5-Spoke Wheels. Gray Base (plastic). Made in Thailand. Toy# DWF07. Released in 2017 as #1 of 6 in the Kroger Exclusive, Peanuts Series.